Babies go through 9, 600 diapers in 3 years... that's a poop ton of diapers (pun intended). You'll need a place to hold all those diapers without having to constantly run to the trash can. Don't look any further than the Diaper Genie Complete Diaper Pail. The only diaper disposal system you'll need for your baby's nursery! Fully assembled with a full sized refill, the pail is ready to get to work as soon as you take it out of the box. A necessity for your baby’s nursery, the 7-layer refill bag, Double Air-Tite Clamps and activated carbon filter work together as the ultimate odor lock system. The Diaper Genie Complete offers a simple, effective way to help keep your nursery fresh by locking in strong diaper odors. 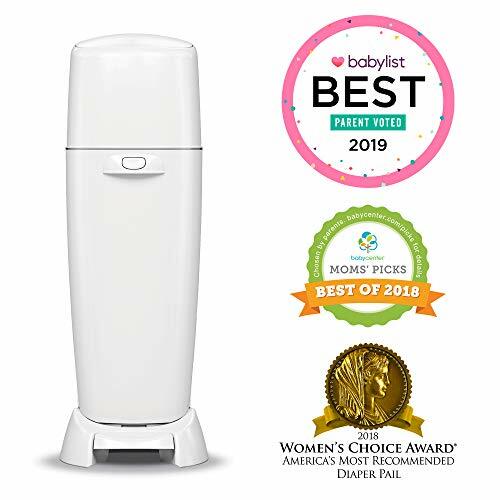 The innovative design also makes dirty diaper disposal quick and easy and locks in odor unlike regular, clamp-less pails that rely on an ordinary lid and plastic bag. From the #1 Selling Diaper brand, the Diaper Genie Complete Pail is all you need for a fresh, clean and sweet smelling nursery.